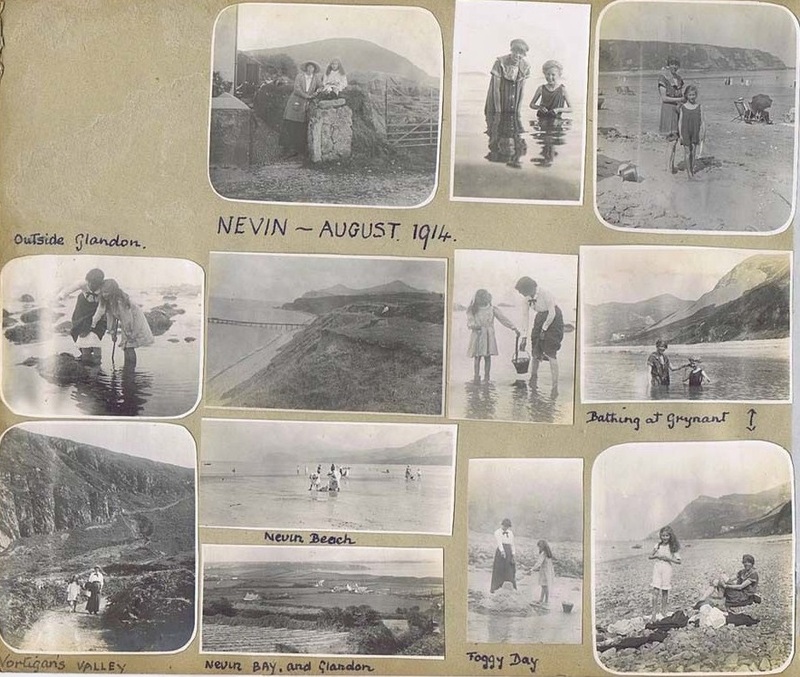 It is not often you come across a group of photographs showing the activities of a family while they were on holidays in Nefyn one hundred years ago. I happened to stumble on such a grouping recently. Since Nefyn had the same attractions then as it has now, the activities were focused on the beach, on the cliffs or on the mountains. But there were subtle differences in the century old photos worth noting and they were certainly not deserving of just being thrown away. 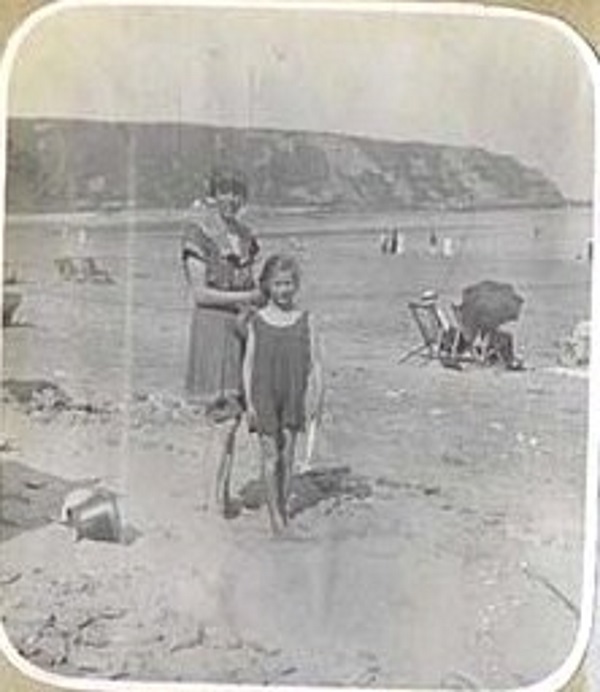 The photos were from the scrapbook album of a young girl who enjoyed her visit to Nefyn and whose father was affluent enough to own an early hand held camera. Those cameras had just come on the market and for the first time people could be photographed pursuing normal activities and not posing in a studio in formal wear with artificial lights and fake backdrops. Nefyn at the beginning of the last century was starting to transform from a maritime and quarrying town into a town focused on becoming a tourist destination for English visitors. In 1900 there were approximately forty fishing vessels sailing out of Nefyn, the town was providing an ample supply of sea captains for ships of the Merchant and Royal Navies, and the local granite quarries employed nearly two hundred men. By the mid 1950’s there were less than five fishermen on Nefyn beach, most of the master mariners were retired or had perished in the two world wars, and the quarries were nearly all closed. Over that same period, the number of visitors to the area increased by several orders of magnitude, doubling the population of the area in the summer months. The beauty of the Lleyn Peninsula was advertised as comparable to the west coast of Ireland or the Scottish Highlands and the railway terminal in Pwllheli made Nefyn, one of the nicest spots on the Peninsula, easily accessible from all over England. The visitors were well-to-do, middle-class families who stayed at the renovated Ashdene Hotel in Morfa Nefyn or the newly built Nanhoron Arms Hotel in Nefyn. They traveled to Pwllheli on a Great Western train followed by a short trip in a horse and buggy or on a Cambrian Omnibus to their destination. The hotel costs and train fares were initially quite expensive but as prices declined and wages and salaries advanced, holidaymaking became more affordable and a growing number of families started visiting the area. The local population also participated by renting their homes or select rooms in those homes to the visitors. It was the start of the transformation of Nefyn, with a holiday summer boom that persisted well into the 1960’s. This group of photos was taken by one of those early middle-class families, a father, mother and daughter who came on holidays to Nefyn in August 1914. There is no information on the family surname or on the name of the girl who was probably eleven or twelve years old. The family stayed at Glandon (Glan-y-Don), on one side of a semi-detached house near Tyn Cae, on the road from Nefyn to Pistyll. The house was occupied by Thomas and Elin Parry and their three year-old son John. Thomas Parry was a coach driver by trade and he was a very friendly man. He showed the young girl how to feed the chickens in the back garden and told her stories about his trips on the horse and buggy. The girl was also fascinated with how Mr. Parry and his wife could so quickly switch from conversing in Welsh to conversing in English. There were photos on both sides of the page with one side labeled Pinner, 1913 and the other side labeled Nevin, August 1914. The Nefyn side had twelve photos. 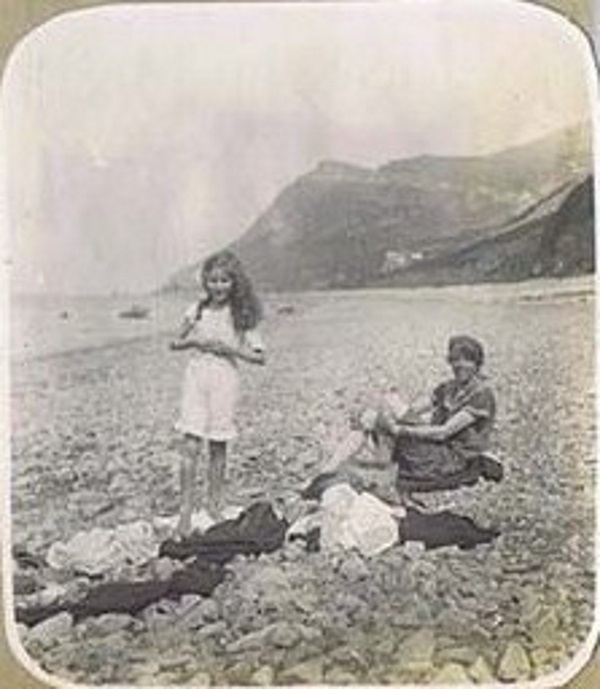 One photo shows the mother and daughter in Edwardian style bathing costumes on Nefyn beach with people sitting around in deck chairs using an umbrella to shade from the sun. The mother and daughter are also shown digging in the sand at low water with people in the background wading at the waters edge and in rowing boats out on the bay. They are also shown in another photo with the daughter sitting on the wall outside Glandon with Garn Bodfean in the background. There are two bicycles on the cobble-stoned alley by the side of the house. Bicycles were in common use around Nefyn in those days and there were cobble stone pathways and pavements everywhere. A photo also shows the mother relaxing on the cliffs above Wern with a granite wagon sitting on the quarry pier in the background. Another photo shows Glandon and Nefyn Bay from the top of the single lane road that leads to the Gwylwyr Mountain by Ddor Ddu. Glandon is in the center of the photo, and there is not a single caravan in sight. The fields across the road from Glandon were filled with caravans by the mid 1960’s. Seven of the photos were taken on a day trip the family took to Nant Gwrtheyrn and its remote beach in Porth Nant or Bae Nant (Grynant as the girl mistakenly refers to it). Mr. Parry used his horse and buggy to transport the family to Llithfaen from where they walked down the long, winding, mountainside road to the seaside village below (Vortigan’s Valley as the girl misspelt). They walked down on to the beach by the Caer Nant quarry pier and proceeded towards the Carreg y Llam quarry at the southern end of the beach. The mother had brought along a basket of food and the family sat down on the beach for a picnic. Although there were people working in both quarries, the beach itself was totally deserted. The upper part of the beach was covered in boulders and large pebbles, a common problem in an area with so many coastal granite quarries. The tide was out and it was a little foggy but the sun shone through now and then. The sea was nice and calm and the mother and daughter went bathing. They also built a sand castle and went looking for crabs among the seaweed and rocks in the shallows. The family had a nice time although the trek back up the steep mountain road to Llithfaen for the ride home was quite tiring. Several photos show that the girl had lesions on her right leg, one near the knee and the other near the ankle. She had the knee and ankle wrapped in bandages in two photos, the most obvious being the photo on the lower left where she is walking with her mother into Nant Gwrtheyrn. She does not appear to be affected in any way by the presence of those lesions. None of the photos on the Nevin side of the page showed the father. I have naturally assumed he was the person with the camera snapping all the photos. The Pinner side of the page has eleven photos and two of those photos do show the whole family, including the father. I guess they lived in what is now Cumbria and it appears the father was associated with the Sedbergh public school near the Lake District. 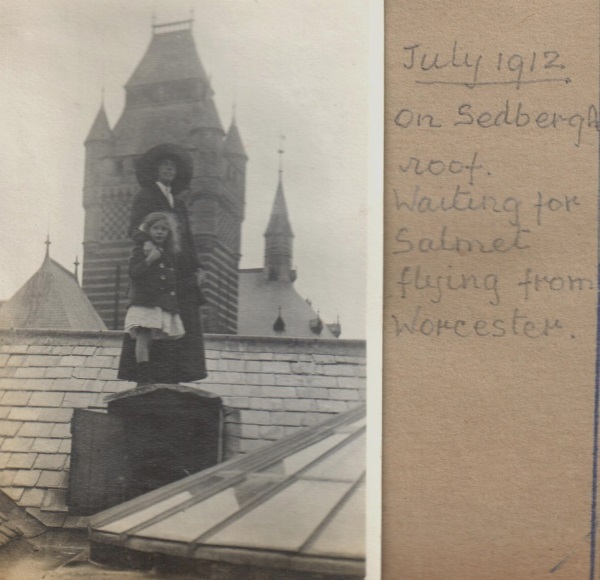 He may have been on the school staff since one photo shows the mother and daughter standing on the roof of the school at Sedbergh in 1912. The notes indicated they were scanning the skies for any sign of the Bleriot airplane flown by the French flier Henri Salmet. Salmet was part of the Daily Mail “Wake up England” tour promoting public interest in aviation and the tour visited over one hundred towns during July and August 1912. Aviation was a novelty in those early days and the tour must have been a great success if people were willing to climb on roofs to try and spot the airplane. 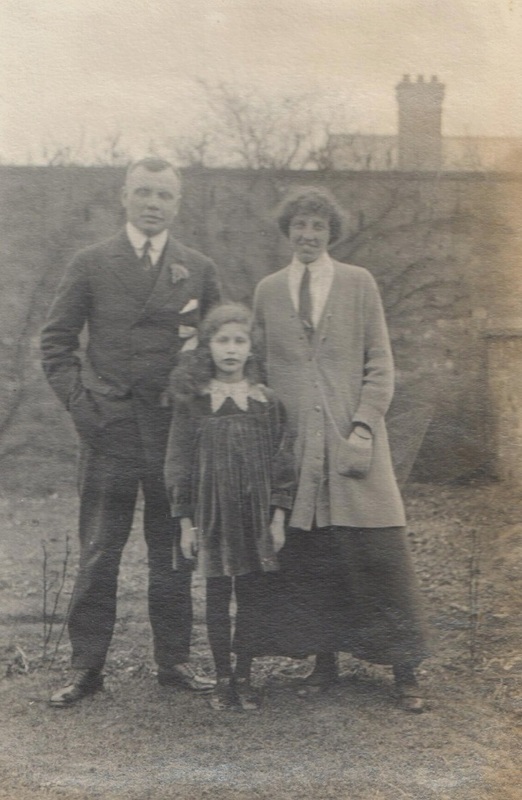 The other photos showed the family visiting what I assumed to be the girl’s Victorian grandparents home in Pinner in 1913, a village now part of Harrow in North London. Perhaps I have been too generous with my assumptions here. I have no other knowledge of the family or whether they ever visited Nefyn again. It is also worth noting that August 4, 1914 was the day Britain declared War on Germany and during the family’s holiday in Nefyn and their day trip to Nant Gwrtheyrn, Europe was descending into the terrible abyss of World War I.